The Centre for Asian Studies (CAS) at Vytautas Magnus University together with the students’ clubs “Hashi”, “Wu Wei” and “Hallyu” invites you to the annual event VMU Asian Week 2018. The event will take place on March 5-9 in various venues of VMU and other public places of Kaunas. VMU Asian Week is a one week-long cycle of events dedicated to East Asia. The event is aimed to introduce general public with the East Asia region through the presentation of culture, languages, martial arts, cuisine. Events organized last time were a great success and attracted a lot of attention from general public and media. You can see the moments from the previous Asian Weeks here. 6:00 P.M.– 8:20 P. M. Movie Night – “Busanhaeng” (“Train to Busan”) (South Korea) (VMU Small Hall, S. Daukanto st., 2nd floor). 6:30 P.M.– 8:00 P.M. Movie Night – “Monkey King: Hero is back” (China) (VMU Great Hall, S. Daukanto st. 28 ). 5:00 P.M. – 7:00 P.M. Movie Night – “Waterboys” (Japan) (VMU Great Hall, S. Daukanto st. 28 ). 6:00 P.M. – 9:00 P.M. Movie night – “Monga” (Taiwan) and discussion with Taipei Mission representative Mr. R.C. Wu and A.G. Fratila. (VMU Great Hall, S. Daukanto st. 28). 3:30 P. M. – 7:00 P.M. Brain Battle and the closing of the VMU Asian Week. Registration is needed. (Vero Coffee House, Maironio g. 7). The partners of VMU Asian Week 201 are Global Japan Office, Hiroshima University Lithuanian Centre, Taiwan Centre. 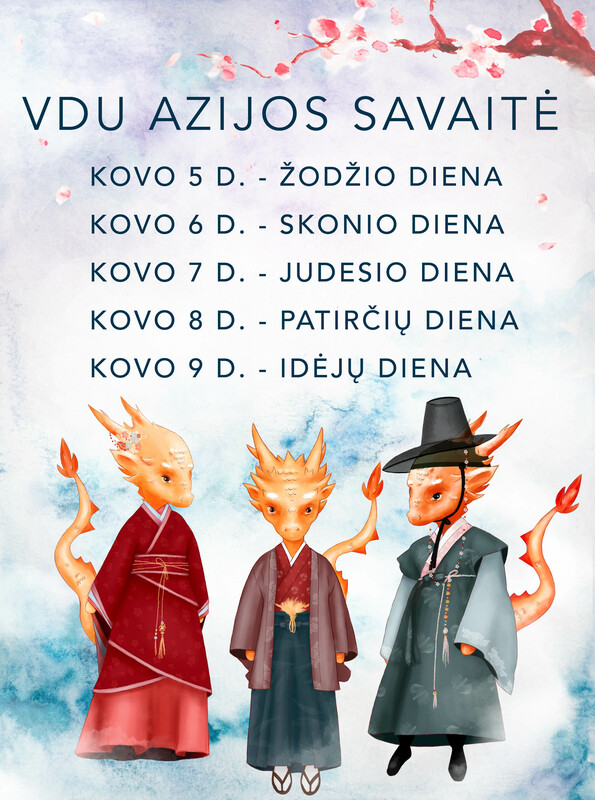 Among other institutions, event is supported by: Embassy of Japan in Lithuania, Embassy of the Republic of Korea in Poland, Embassy of the People’s Republic of China in the Republic of Lithuania, Korean Cultural Center in Warsaw, Korean Community in Vilnius, etc. More detailed program (time and place) will be presented in few weeks before the actual event. Check the details in our Facebook page and website.